Which century are we in exactly? What you see there, ladies and gentlemen, is an item that, according to The Sun’s Deputy Political Editor, Steve Hawkes (@steve_hawkes), is apparently on sale in Sports Direct. Because as we all know, in 21st century Britain it’s entirely appropriate to tell our daughters that a dustpan and brush is for girls. It would be be silly to dream that my two daughters might one day become actors, or doctors, or butchers or bakers or candlestick makers if that’s really what they had their hearts set upon. Instead, I should just take them down to Sports Direct, point at what’s on display, and explain that, you know, dreams are all very well for boys, but the best they can hope for is to one day reach the lofty status of a modern-day Cinderella. I can already hear the cries of “you’re overreacting” – but am I? In a world where we already know that girls are so often at a disadvantage, and that boys’ views of them are tainted by all sorts of unhelpful imagery and everyday sexism, why on earth are some people buying this stuff? I agree with you, that toy is horrendous. But…! Girls are whooping boys at school and at university. Med school intake is majority girls, and whilst I don’t know I suspect RADA is the same, so obviously girls aren’t being put off dreaming about doctoring or actoring. Could it be that as children, y’know, grow up, they do what they want? I also think that the example parents set is significantly more important. Whether you buy your daughter a truck or a doll, if Mum does all the housework that is what she is going to assume is normal, and what she will probably wish to emulate to an extent. If Mum is constantly stressed about losing weight and being pretty, that is going to impact the daughter far more than what she gets for Christmas. Finally, having recently been reminded about the tragedy of children being removed from their neglectful parents, I do find this recent spate of handwringing about gender roles crushing the dreams of poor little girls a little bit tedious. There are both girls and boys out there who are developmentally stunted and emotionally damaged because of their incapable, chaotic parents. Someone loving them enough to give them a toy and play with them does miracles for their social development – whatever colour it is. I think you’re right: children who are given the opportunity to succeed, and who are loved, broadly DO get to to whatever they want when they grow up. And clearly, there are more important things in the world than the colour of our daughters’ Lego. What concerns me more is what this kind of message gives to ALL our children – not just the girls. If, from a young age, our society is sending out the message that girls are subservient to boys, that they’re the ones who do the cleaning, and that they should be cute and pretty, we shouldn’t be surprised when, come the teenage years, some boys start viewing the girls around them in a much more pernicious way. Having raised a girl and two boys without any type of stereotyping (well as little as possible) I found my daughter loved to help me clean and my sons had very little interest in it. The younger son would sometimes join in but on the whole they couldn’t be bothered with it and she loved it. All three of mine have been taught to look after themselves. 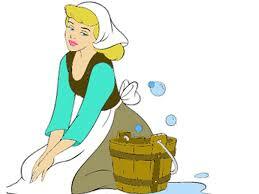 They can clean, cook and iron. I made sure of that and yet my middle son will stop and let his grandmother, girlfriend or any other woman who wants to fuss over him do it for him. My dad did his bit around the house and I raised my boys to do their bit and yet they still conform to gender roles of what men do and women do. Still. I would never dream of buying my daughter a bunch of cleaning tools as a toy. However you can buy ovens, cups and saucers and other toys that are bought very much for girls so why not a dustpan and brush… even if it is the worst gift ever!!! 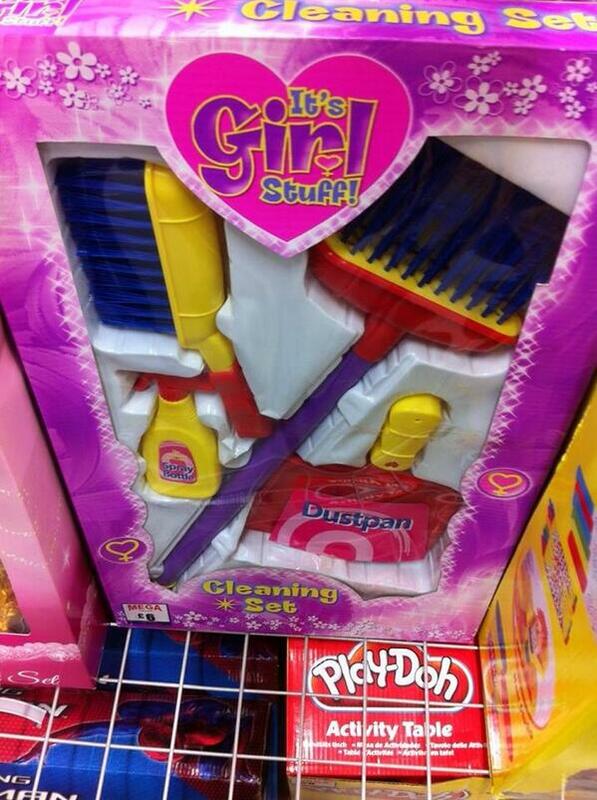 It can always be handed to a boy and let him know it may say ‘it’s girl’s stuff’ but boys can use it too. Oh and having raised a girl I can you tell that as long as you raise them with self-belief and confidence when they set their minds to something nothing will stop them – not even a boss with gender issues and his views on a glass ceiling for women. I have a four-year old boy and a two-year-old girl, and this kind of nonsense makes me fear for both of them. My son has already told me that red couldn’t possibly be my favourite colour, because I should like pink best (and this from a son whose Dad occasionally wears a pink tie, and whose little sister is dressed in all colours of the rainbow). The pernicious influence of gender stereotyping is everywhere, and to me it feels as though it’s worse than when I grew up (especially where toys are related).